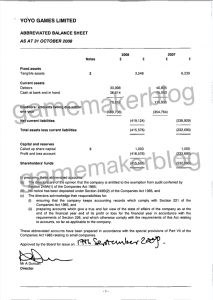 In the year to October 31st 2008 YoYo Games Ltd, who own the exclusive rights to distribute and exploit the Game Maker software, made a loss of over £180,000 (~$285,000 USD). 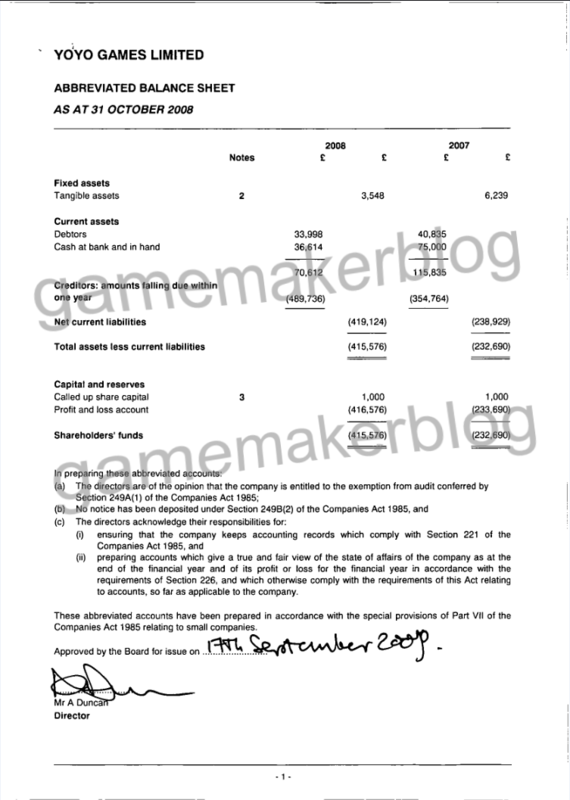 In the previous year to October 31st 2007 a loss of £240,000 (~$380,000 USD) was filed in the company accounts signed off by CEO Sandy Duncan. The figures, listed at Companies House, put numbers to a comment made by Sandy about YoYo’s profitability (or current lack of it) five months back. Just noticed this thread..you guys get everywhere. YouTube has Google who are making upwards of $4bn a year in profit to support it. YoYo Games does not. Its not that bad, YouTube still hasn’t made a profit for Google yet. The problem with the game store concept is that most of those with the ability to make a game good enough to sell can be better furnished by building their own sites and getting direct sales rather than farming it over to YYG, so the problems will still persist. At best, they’d then be placing themselves as a portal and in direct competition with other better established portals. The best thing they really could do is to spend less time worrying about YYG and more time and money spent on GM development. That’s the golden egg in this story and its almost neglect for a couple of years is mental. If they had a game shop, who’s games would they sell? There would have to be some say 50/50 agreement which is just work, problems, and trouble. Besides, even though some Game Maker games can be quite impressive the really aren’t worth paying money for. and, heh, YoYo doesn’t even know anything about web design [that is to say] ad placement. It makes them look bad, like one of those sites who don’t really want you to visit their site, just click their ads. I always wondered why they decided to buy GM. From a business perspective, making a fancy site for it and employing a company’s worth of employees to develop new versions so that a bunch of amateur game developers will a) purchase it for â‚¬20 (and later â‚¬25) b) get a free copy because they bought it last time or the time before or c) use the crack. As far as I can recall, Mark never made a profit either, and used all the registration fees to cover the website costs. Game Maker is a good platform. Its 3D isn’t too great, and it has some speed issues, but for a lot of indie developers, stuff like that is outweighed by its ease of use, and how quickly you can get something up and running in it. If they do manage to get out of this rut and start making a profit, I will be very impressed. I hope they get some good money out of GM8. There hasn’t been a release in two years and it brings some great new functionality to the IDE. Not to mention the runner improvements such as the vastly reduced script overhead. I heard they were working on a store, but the quality of the games is that poor, I’m not even going to download them, let alone play them. There are a few exceptions to that though, and its only a matter of time before some of the better developers opt to leave game maker for something that lets them do more. @Garion Alexander Duncan. Sandy is short for Alexander. They have mentioned that they are working on a store to sell games. So, how long will it be before Yoyo Games files for bankruptcy? In my opinion the only way Yoyo can start to make money is buy releasing a serious version of Game Maker, getting some game companies to start to develop with it and having some sort of iTunes style Game Store where people can go and buy (decent) games in a centralised location. Q: What’s the likely chance that will stop people bitching about GM8’s price?